The MOBNET Technical Seminar with final users was carried out the last February 23rd in Warsaw, as the culmination of MOBNET project. The results obtained allow us to affirm that the technical objectives of MOBNET have been met successfully. 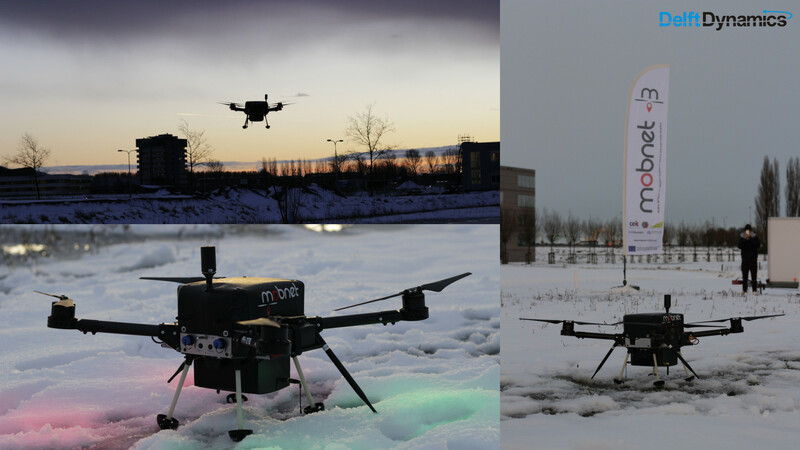 At the end of december 2017, a Mobnet tests meeting took place in Delft, where the drone was successfully flown even though the snow and low temperatures. After the initial tests of the system in the laboratory, the set-up of the ground station was carried out outside and several test flights were carried out. In the test field, two mobiles were placed so that the system could detect its position autonomously. We have obtained sucessful results, since one of the mobiles was located through the positioning system of the BTS and the other was detected through the use of the mobile application. After these tests, it has been verified that the requirements of precision and functionality established at the beginning of the project have been met. New test campaigns are going to be carried out in the coming months to obtain a greater amount of data that allows the algorithms to be well adjusted and achieve better results. After these tests we can ensure that the location of people using the technology of MOBNET is fully viable and that it meets the established requirements. On September 29, the second integration meeting between CEIT and ORBITAL took part to prove the communication with the new DCT updated module. Integration has been fast due to the previous knowledge of past meetings; finishing with a successful result, with a perfect communication between the modules. 2 smartphones has been detected through an application and all the mobile information has been sent through the datalink to the ground station in which its position has been represented on a map. MOBNET is coming to the end, and we will have the whole system integrated in the UAV and helping in rescue missions in a short time. Last June, an integration meeting was held in Delft, The Netherlands. All members of the MOBNET consortium went to test their modules mounted on the drone and check all the systems running during the flight. The first day, we worked on the initial tests of each subsystem. As they were started up and checking their functionality began the tests of communications between subsystems. Finally the last step was the integration on land of all subsystems in the drone mainframe. For the tests, two phones were placed in the field separated by about 20 meters. The drone flew over the field where the mobile devices were settled, which were located thanks to the MOBNET system. The high-precision positioning algorithms of the EGNSS module allowed to detect these positions with high accuracy. The user interface showed all this information in detail and thanks to the offline mapping system, it was possible to see the location of the mobiles on the ground. At the end of this successful meeting, we toasted with champagne to celebrate the success of the firsts drone flights with the whole integrated system. MOBNET system assumptions were presented during TRANSCOM 2017, the 12th international scientific conference of young scientists, Ph.D. students and their tutors. MOBNET system assumptions were presented during TRANSCOM 2017, the 12th international scientific conference of young scientists, Ph.D. students and their tutors. It took place between 31st of May and 2nd of June in Grand Hotel Bellevue in Slovak city High Tatras. The conference main target is to build and expand international contacts and co-operation between the scientists. The article will soon be published online (open access) in Proceedia Engineering (http://www.sciencedirect.com/science/journal/18777058). The title of the article was: 'The use of UAV's for search and rescue operations'. The article was created by the partners from the Main School of Fire Service in Warsaw, Poland: Marzena Półka, Szymon Ptak, Łukasz Kuziora.